The HD-9 series of 4,082-kg. four-post lifts contains seven different lifting models. 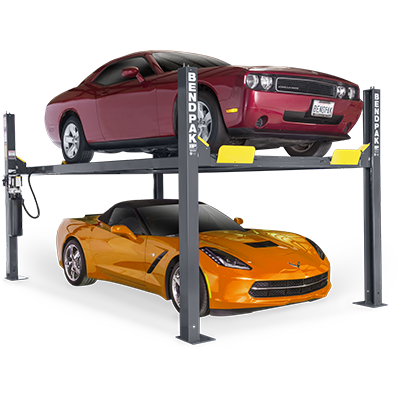 Each four-post lift is perfect for vehicle storage and service, whether you’re working at the shop or your home garage. Each model is available with optional casters, drip trays, jack platforms and more. A four-post lift requires a serious level of engineering. To reduce strain on the columns and provide ample lifting security at all times, BendPak uses the most durable stainless steel lifting cables, as well as the single hydraulic cylinder, to provide an incredibly powerful and smooth lift operation. With proper use, this car lift will work as well on day 5,000 as it does on day one. The HD-9 offers our largest variety in any BendPak four-post lift weight class because most vehicles serviced by most shops weigh less than 4,082 kg. If you need to lift heavier vehicles, we have larger-capacity models that keep you covered. For many of you, however, the HD-9 Series will hit the sweet spot for powerful lifting, compact design and product value. Browse our 9K section to see all of what you can get on these models. Dual-hub cable sheaves are more expensive to manufacture, but it’s not a cost we push back onto you. They’re necessary to prevent axles, sheaves and cables from burning out before they should. Our philosophy is that your lift should be the last thing you worry about first thing in the morning. Unique service technicians require unique servicing positions; with the HD-9, you can safely lock your four-post lift at varied heights, so you’re never crouching or reaching uncomfortably to perform auto maintenance. If you’re raising the lift for parking purposes, that variation is going to come in handy, depending on how you stack your vehicles. Each four-post lift comes with four lifting cables made from superior-grade stainless steel. Each individual cable is rated to handle 6,531-kg. This makes their combined rating over 640% of the total capacity. These cables are hidden within the post columns for both the safety and overall streamlined look of the lift. No one wants to see a cable dangling on the outside of a lift. Tuck that thing away! No need to worry about maintenance on your electric-hydraulic power systems! The controls are all within reach, so you can stop, start and reverse your four-post lift on a dime. 254 mm x 305 mm base plates keep your car lift rooted in place for as long as you own it. Make sure the ground is level and you’re good to go! Ask us about the 4-piece caster kit that fits all our 9K four-post lifts. They turn your stationary lift into a mobile parking and service station. You can even leave a car on top while you move it! We keep our four-post runways to a low 114 mm, so low-stance chassis can be comfortably driven onto the lift. Not only are our runways low, we extend them farther than others in the industry. This better suits the lifting of sports cars and other low-standing vehicles. Every BendPak four-post lift is designed with a safety-first mentality. To this end, four locks engage simultaneously as the lift is raised, and a backup locking system catches cable slack in the unlikely event of cable failure.